Curmudgeonly & Skeptical presents Boned Jello: McCabe Pays For His Sins! 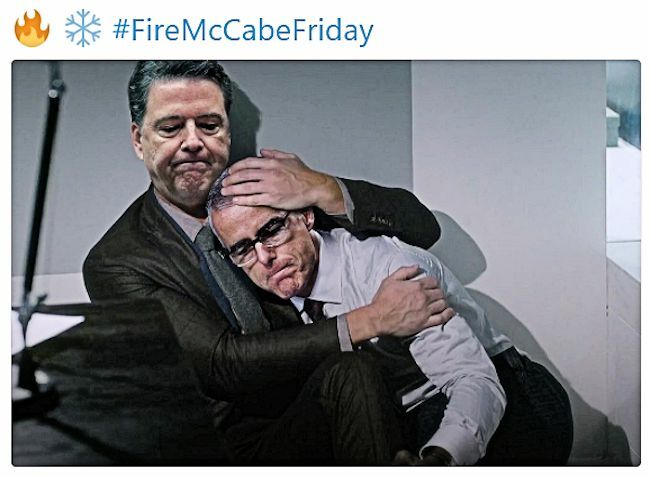 McCabe Pays For His Sins! He pays for one or two of his sins. This does, however, tell me that there is a possibility of a mass arrest coming. More people are aware of the attempted coup. Then the trials. And then the executions. Each day revelations tell us of the involvement of more of the conspirators. Oh, and it's a beautiful day today! By my lights, it's a wonderful day! It seems that if any govt agency hires him to do any job then after 2 days he gets his full pension. Spit. It's what I call a good start. A good chief of staff would put word out that any agency hiring McCabe will lose whoever hired him and the horse they road in on. Yes, that one or two day bit bothers me, but it's something that can be dealt with. Harshly. I suspect that he has enough sick days, comp days and vacation days accrued to protect him from loss of his pension. All rules are written to protect government employees from paying for their corrupt ways. From what I'm reading on the interwiz, Sessions has someone not part of the country club investigating. Otherwise, doing what a special council would do, without a special council. That's a good thing, if the final result is some funerals for traitors. Just got word that President Trump hired Joseph DiGenova. Not as Attorney General at this point, but as an attorney. I think this is very good news.